Don't expect any big surprises out of Dell's first Windows 8 tablet aimed at enterprise users. The unreleased tablet reportedly has a 10.1-inch display with 1366-by-768 resolution, an Intel Clover Trail Atom dual-core processor, 2 GB of RAM, up to 128 GB of solid state storage, a 2-megapixel camera in front and an 8-megapixel camera in back, according to Neowin. It is said to measure 0.4 inches thick and weigh 1.57 pounds. 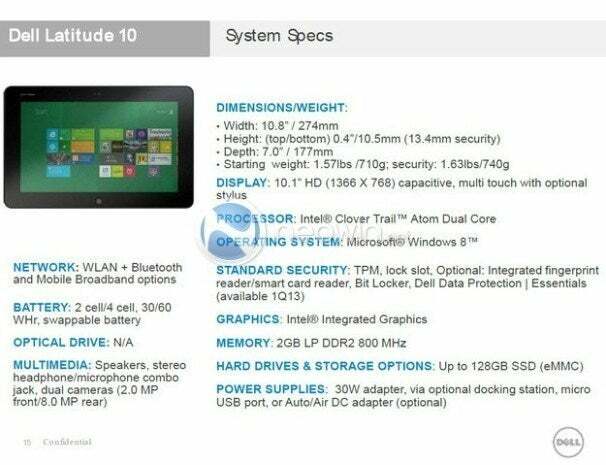 The specs are similar specs to those of the Hewlett-Packard “Slate 8” tablet that we heard about a month ago. The specs indicate a mostly generic first attempt at a Windows 8 tablet, but Dell may try to stand out from the pack with security features. The tablet reportedly includes a TPM security chip and a lock slot, and has an optional fingerprint or smart card reader, Bit Locker support, and Dell Data Protection. Last week, an unnamed source told CNet that more than a dozen Windows 8 tablets based on Intel's Clover Trail processor may launch in November, and more then half of them will be tablet-laptop hybrids. This Dell tablet would presumably be one of them, but Neowin suspects that the company has more devices up its sleeve. If the leaked specs from Dell and HP are any indication, we may not see much differentiation from PC makers when it comes to speeds and feeds. Instead, they'll have to stand apart on price, design -- especially in the case of hybrids -- and accessories such as keyboard and trackpad docks. We've heard very little on these types of details for any Windows 8 tablet, but expect that to change over the next few months, as the launch of Windows 8 approaches.